This just never gets old. We all love wearing and styling lehengas, and the one way we can differentiate our look is via the dupatta. There are so many ways to style Lehenga Dupatta. You can wear it using accessories like belts or pin it up in different ways. No matter what occasion, there are different dupatta draping styles that you can go for. In the past, I had shared 21 different lehenga dupatta draping styles with you all. But of late, I have been seeing a lot of designers show us how to style Lehenga Dupatta depending on the occasion we dress for. So, if you’re interested in bookmarking some of these lehenga dupatta drape styles, keep scrolling. Where To Shop Affordable Double Dupatta In Delhi? I thought let me address this right at the beginning. I met a friend-bride yesterday who had worn this gorgeous Sabyasachi style bridal lehenga to her Dehradun wedding. So I got some budget inputs from her on where to buy double dupatta. If you are shopping in Delhi, go to Maliwada Lane in Chandni Chowk. It is right next to the Paranthewali Galli. You can easily buy the second dupatta for prices starting at INR 800 upwards. A pretty decent embroidered dupatta with minimal butti work will cost you around INR 1200-1600 here. Keep in mind, if your bridal lehenga is in traditional colours of pinks and reds, finding a second dupatta will be that much easier. If your lehenga is in offbeat colours, you might just have to search a bit harder to find the right shade. Also, the range of options will be fairly limited. This woman has completely changed the game of how to style Lehenga Dupatta. If you go through her tutorials on Tia Bhuva Instagram page, she does beautiful saree drapes on lehengas. Whether you have a silk saree of a chiffon saree, there are more than a few ways of styling your saree as a dupatta. While Sabyasachi has a signature style for all his lehenga dupattas, brides of Sabyasachi, on the other hand, show us more than a few combinations of how to Style Lehenga Dupatta. I love the loose fall off the front dupatta. Keeps the hands free and mobile, while the second dupatta is draped in a classic over the head pinned up style. Go for this look if you have a heavy embroidered blouse that you’d like to show off. If you have a heavy upper body, this look might not be flattering for you. However, you can play with the second dupatta by bringing it one side to the front. If you are a bit on the heavier side, styling the second dupatta by covering one side can also be a good trick to get a lean figure. This is just a slight variation to the one above. If you have a thick heavy embroidered lehenga dupatta, then you can alternatively also drape it like here. Use the second dupatta to freely move it front and back to give it the right amount of flair. My jaw dropped when I saw this beautiful Sabyasachi bride. Her lehenga dupatta style is pretty straightforward. However, it gives such a nice look when the bride twirls. The look is slightly different than the first style suggested in this list. Here, the second dupatta comes in the front on both hands. I am sure you know how expensive getting a second dupatta can be. Most of the premium designers do give the option of a second dupatta. But it comes at a steep price. What you can instead do is be happy with a single dupatta and really show off that blouse and lehenga skirt. Simple, stylish and the best part – you don’t need a draping stylist to get this done. While one hand is going to be tangled in your dupatta, the second one is completely free to show off that gorgeous lehenga blouse. It’s a classic no fuss Style Lehenga Dupatta that is literally a five-minute get-ready look. Oh my gosh, I love this lehenga. It doesn’t catch your eye at first, but that colour is just so heavenly pretty. Also, notice the contrast floral dupatta. So chic, isn’t it? I think this has to be the best possible way to Style Lehenga Dupatta in this case. Can’t really get the same stunner look with other traditional draping styles, right? I wish I knew exactly where this dupatta was pinned. On the side, right in the middle of the back. But anyhow, I am sure you can experiment and recreate the look. It’s easy, effortless and this Sabyasachi lehenga looks so good for a mehendi function. You can also add a belt to this style if you want to funk it up a notch. If your dupatta is heavy work embroidered, then this is an excellent way to show it off. No dupatta drape blog post can be complete without sharing the Gujarati style dupatta drape. It looks amazing and you can never go wrong with this style. 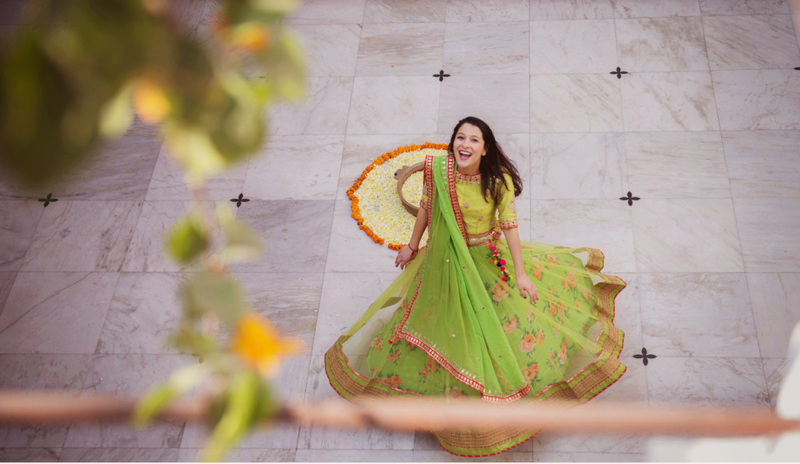 The idea behind this post is to give you tons of different Style Lehenga Dupatta that you can wear for your prewedding to wedding functions. No need to do the same old drapes for every function. If you have two contrasting colour dupattas for your lehenga, take the contrasting colour and wear it above your head to show off the colour. Light colours in a soft net fabric are lightweight and look amazing. If you have two dupattas, this is what I would call the no-fuss look. Simple, easy and effective, it looks great in pictures and is easy to maintain through the day. Neha Dhupia wore her lehenga dupatta in a similar style. Covering the entire blouse and midriff area is something I wouldn’t recommend if you have a heavy work blouse. But this look can look great for a sister of the bride or for your pre-wedding function. Also, you can opt for this look if your dupatta looks richer than your blouse.